If we could select any player from any era, here's the team we'll field in the next FIBA tourney. A few weeks back, Shaquille O’Neal and Scottie Pippen had a beef about the Lakers and the Bulls’ all-time starters. This prompted Yahoo’s hoops blog "Ball Don’t Lie" to hit the archives hard to come up with a series of articles discussing the NBA's best all-time lineups by team. We say, it’s about time we join the fun, this time doing it for the local teams. Here we identify the all-time starting five of the country’s’ local basketball outfits, from PBA teams, college teams to the national squad. With the 2015 FIBA Asia Cup just around corner, there’s no better way to open up the conversation than to discuss Team Philippines’ All-Time First Five. Carlos “Caloy” Loyzaga was the man! He was just 6’3” but he was the best big man the Philippine National Basketball team has ever had. He was a two-time Olympian who led Pilipinas to four Asian Games gold medals (1951, 1954, 1958, 1962) and two FIBA Asia Championship titles (1960 and 1963). Loyzaga a.k.a. "The Big Difference" is also responsible for spearheading the best finish by any Asian country in the history of the FIBA Worlds as he and his troop nabbed the bronze necklaces in 1954. In the same tournament, the San Beda College product was the third leading scorer, averaging 16.4 ppg—good enough to be awarded a starting spot in the All-World Team. His track record speaks for itself, folks. In his heyday, Mang Caloy, was one of the planet’s top ballers. His 9.3 ppg and 4.3 rpg averages in overseas events seem unimpressive but his formidable presence is undeniable. As a raw 23-year-old, Ranidel helped Team Philippines win basketball gold at the 2003 SEA Games. Fast forward 10 years later to the FIBA Asia Championship, and you'll see that RDO has grown into a crafty player with a dependable touch from long range. In his role as a stretch four, he became one of the weapons that Gilas used to beat long-time tormentors South Korea. During the 2014 FIBA World Cup, despite playing hurt, the Cavite-born forward squeezed out all the strength he could in his 6’ 6” frame to contend with his much larger adversaries. The national team roster had one of its most reliable players in De Ocampo. During broken plays or when the squad is struggling on offense, asking Ranidel to bust out an unorthodox “up-and-under” or a surprise jumper to bail your team out is a good option. The Triggerman is a world-class shooter. He was a marked man whenever he stepped on the floor for Team Philippines—which he had done numerous times. “Look out for number 8!” became a primary instruction from foreign coaches when their teams faced the Filipino sharpshooter, referring to Caidic’s jersey number. That’s good coaching because the Triggerman’s shooting ability belongs right up there with the sniping skills of the Larry Birds, Reggie Millers, and Stephen Currys of the world. And we're not even remotely exaggerating. Behind the UE Red Warrior legend’s sweet stroke, international honors came left and right. Among those were championship wins at the ’85 SEA Games and the ’86 FIBA Asia Championship. His record-tying four appearances at the Asian Games during his time led to his getting named to the All-Asian team twice—first in 1990 and the second in 1994. He led the tournament in scoring in 1994. He also went up the Asian Games podium thrice, capturing silver in 1990 and bronze medals in 1986 and 1998. Just like Caloy Loyzaga, Allan Caidic’s place in this list isn’t up for debate. Avelino “Samboy” Lim was faster, more explosive and had longer hang-time than his peers during the '80s and early '90s, thus making the 5’ 11” shooting guard an indispensable weapon for Team Philippines. Nicknamed “Skywalker” for his jaw-dropping aerial assaults, Samboy summoned a level of athleticism that was ahead of its time to manhandle his defenders. Whatever the opponents' nationality was, the former Letran Knight didn’t discriminate. Each time the audience saw the guy wearing No. 9 with the knee-high socks checking-in, they knew that the Philippine contingent was about to get buckets. Testaments to his greatness as a national player were his 37-point outing against Italian squad Banco di Roma at the FIBA World Club Championship while having an asthma attack—literally risking his life for Team Philippines; and his gold medal-winning efforts at the 1984 FIBA Asia Champions Cup and at the 1986 FIBA Asia Championship. At the 11th Asiad in 1990, he became an all-tournament member on the way to helping the team win silver. 3) Float in the air far longer than most people. 4) Do sweet finger roll. Choosing Cap Jimmy as Team Philippines’ all-time starting uno was a tough call—with names like Jaworski, Calma and Jayson Castro included in the pool of great floor generals who repped the country. But one decisive factor went in the 2011 PBA MVP’s favor: clutchness. Whenever a game’s outcome is hanging in the balance, Gilas could count on their diminutive team captain to hit a momentum-shifting three-ball or make a crucial assist or nail the pressure-packed free throws. 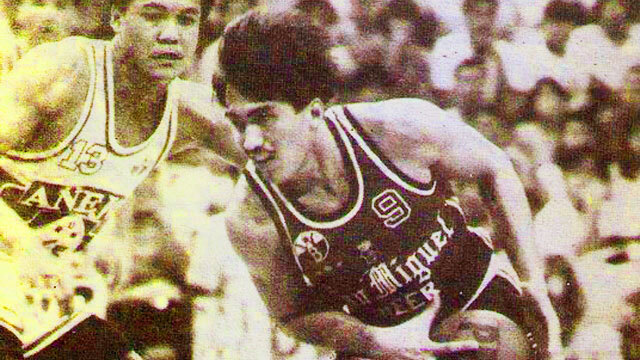 Philippine Basketball’s "Mighty Mouse" was always there to save the day. To drive our point home, we implore you to look back at his heroics in ’13 FIBA Asia Championship silver medal game versus South Korea and his inspiring performances in both the 2014 FIBA World Cup and the 17th Asian Games.